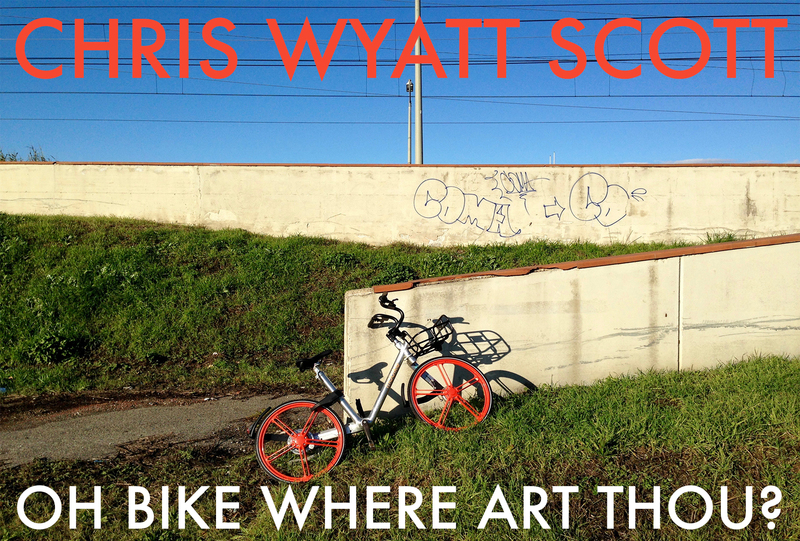 In this Spotlight Interview guest contributor Melissa Kirk talks to artist Chris Wyatt Scott about his art practice and his upcoming show Oh Bike, Where Art Thou? at the SACI Gallery, opening Monday, March 5 at 6:30pm. I see that you have traveled quite a lot. How has traveling impacted your overall art practice? Maybe I am more of a traveler than an artist! I am a collector of things and ideas. The images of all I have seen and done are a source of endless inspiration. There is no better education. I have art supplies scattered all over the world. You studied abroad in Florence in 2004 and spent around a decade moving around Europe until you went back to the states in 2012 and settled down in Reno, Nevada. What led you to reside once again in Florence? How long have you been living here this time around and do you think you will stay permanently? Actually, I studied a semester here in 2000, came back alone for the whole summer in 2002, moved to LA for two years and then, after hating life there, decided to sell everything and move to Florence. I didn’t even email anyone in Florence first. I just showed up and lived in a hostel for 3 weeks before I found work and a place to live. I lived here eight years then got a little burnt out and thought I would give America another try. My dream was to come back to Florence twice a year, but instead I ended up coming back once every two years. In May of last year I was here on vacation and at that point made up my mind to come back to Florence. I went back to Reno, closed up my store and was back in Florence in September. I came back because of an elderly friend that needed some help, and to have the chance to work with some old friends. And, I just missed it here. I know it better than any place I have ever lived. It has been 6 months now, and I will be heading back to America soon to visit family, but then I’ll be back in Florence. Before going to art school you were in the Marines. What made you decide to go to art school? Have you been practicing art your entire life, or was it a something like a sudden burst of inspiration and desire that led you to pursue your art career? I was always interested in drawing as a kid and I was encouraged to do whatever I liked to do. When I finished my military service I went straight to college and naturally got into art and art history. That is really what brought me to Florence the first time. Once here, working as a window-dresser showed me that I could make a living while making art. I have not had a ‘normal’ job since. You are also a furniture designer, painter, drawer, and musician. Do you favor a certain medium over others? I have managed to be what I make and vice versa (I make what I be?) I don’t have an ‘artistic’ side, it’s just me full-time. I think the tendency is to like most what I am working on in the present. Humor and being useful. I have to make myself laugh and I have to feel like the things I make serve a purpose. Sometimes that purpose is to make others think or laugh as well, and sometimes it is to give them a place to sit or store their things. I also set out to bring light to things that I feel are unjust or unexposed. When you go to make a piece of art, how do you get started? Do you have a routine or process? An idea usually arrives in my head as a ‘statement’ or as a fully formed idea, then I have to backwards-engineer how to represent it. I have a mental inventory of materials that I have on hand, as well as any new processes that happen to be in my head at the time. These things quickly swirl together, and then all there is to do is to get down to making it. Is there a specific reason you create the work that you do? It is coming from a desire to be self-sufficient in the management, processing and moving forward with all the inputs that arrive in my head. Some people get sad and listen to a song. I would rather write one. Your show “Oh Bike Where Art Thou?” opens at the SACI Gallery on March 5. What inspired this project? This set of ideas and work all came about from the small shock that I got from seeing bike-sharing company Mobike in Florence. You know, that ‘tech cringe’ that comes from seeing another object become ‘smartified’. Like most new or commercial things I find it very misleading, and as a bike lover I felt I had to step up and put my two cents in. Do you think this bike-sharing system is beneficial to the city of Florence, or do you think it is an inconvenience? Easy answer: NO. The bike sharing system that has arrived in Florence is nothing more than a Trojan-horse to collect data. The city has been duped in allowing them to come in under the auspices of convenience and being environmentally friendly, but in the end who benefits? A foreign corporation. Foreign manufacturers. And, it’s a horrible excuse for a bicycle. In fact, it gives all bicycles a bad name. The standards have been lowered and it will be a lot harder to raise them again. Do you have any future plans for your artwork? What’s next? I do have a couple other ideas on the burner that are inspired by Florence but really resonate everywhere in the world right now because they touch on economics and immigration. Oh Bike, Where Art Thou? A playful look at the sudden presence of bike-sharing in Florence and its effect on the overall psyche of the city by lampooning, mimicry and appropriation. The aesthetic, usability and reach of these objects often touches on a deeper level than that of pure convenience. Highly engineered and technologically equipped, the bike sharing-model claims to solve problems but at the same time it’s just another piece of ‘tech’ weaving itself into our lives. What is it replacing? And, where does it go from here. Born in 1976 in Rochester, NY, Chris Wyatt Scott has since lived in over 40 houses and apartments. After high-school and serving in the Marines Chris obtained a degree in ‘Painting and Drawing’ from Mira Costa College in Oceanside, CA. The early 2000s found CWS active in the Los Angeles music and art scene performing in key venues and organizing group shows from his residence on historic Adams Blvd. Taking part in a study-abroad program led him to Florence, Italy in 2004 and to nearly a decade as an American ex-pat living and working in Europe. Those years were spent as a window-dresser for high-fashion stores and brands, then as a touring musician playing in over twenty countries. In 2012 CWS relocated to Reno, Nevada and opened a store selling his brand of custom furniture called ‘Corner Craft’. As an artist in Reno, CWS found inspiration and an audience in the desert geography, the immensity of the Burningman community and the dynamics of a city in the process of gentrification. Chris Wyatt Scott is once again living in Florence. 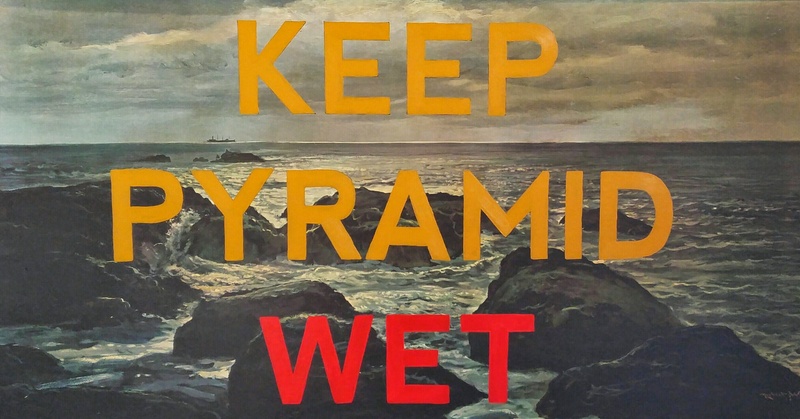 ‘Keep Pyramid Wet’ 2016. From a series of 7 acrylic on found paintings that I did to bring awareness to Pyramid Lake. It is where the water from Lake Tahoe ends up, or doesn’t end up because of water diversion. There is an organization called ‘Keep Tahoe Blue’ but Pyramid Lake is sort of neglected and not thought of as much. It is also on a native reservation that is completely poor and undeveloped. ‘Signs’. I made these in Florence back in 2008/09. I’ve made a few different series of these since. ‘RENO Camping’ 2017. 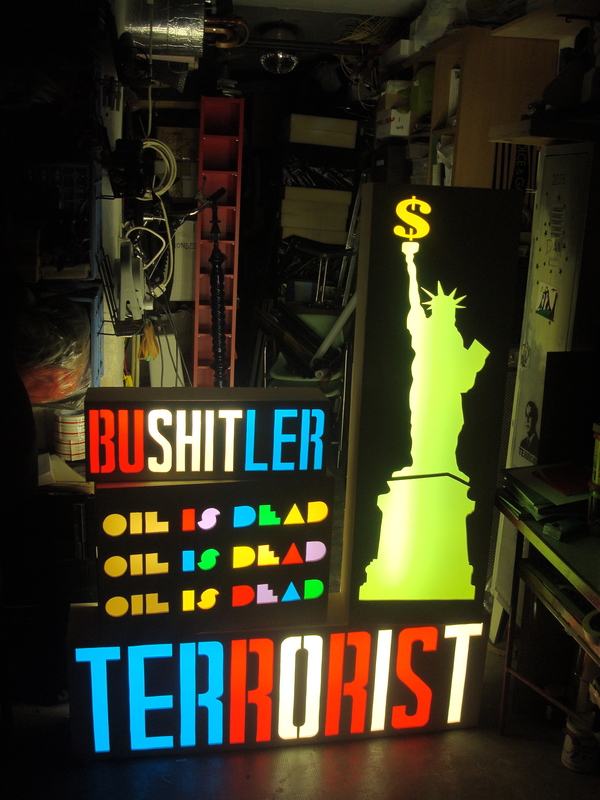 This is from ‘Reno Sculpture Fest’. 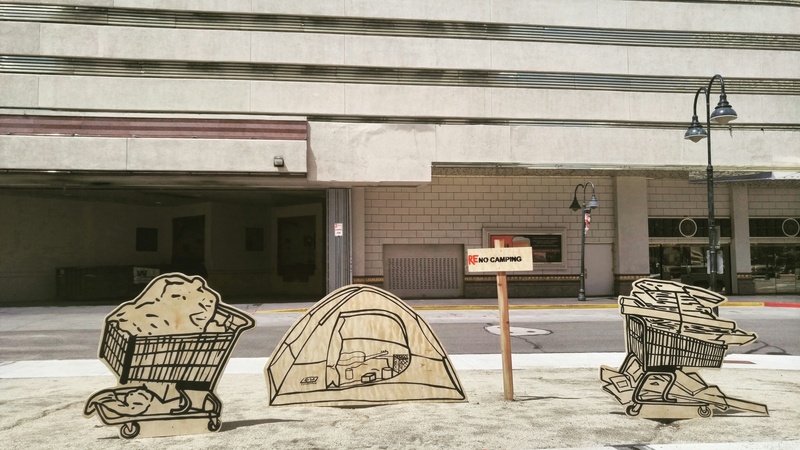 I went along the homeless encampments and photographed some tents and shopping carts and made cut-out portraits of them. When I left Reno I stuck one of the shopping carts and a sign in the Veterans memorial park downtown as a ‘gift’ to the city. Not sure what they did with it.